According to a representative survey carried out in Switzerland, Germany and France, 89% of the population call for a strengthening of solidarity between the generations. 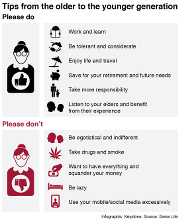 63% regret a lack of acceptance of older people in society. Almost two thirds of those surveyed take it as a given that redistribution from young to old will lead to conflict. 65% of all respondents think that the young are too preoccupied with themselves. Millennials (18 to 35-year-olds) and Generation X (36 to 50-year-olds) are even more convinced of this, with 70% of respondents from each cohort answering in the affirmative. 52% of Millennials believe that older people today are living off the young. 86% of Veterans (66 to 79-year-olds) disagree with this assessment, as do 77% of Baby Boomers (51 to 65-year-olds). Younger people also see an imbalance in political affairs, with 46% of Millennials and 39% of Generation X finding that older people enjoy disproportionate power at the ballot box. 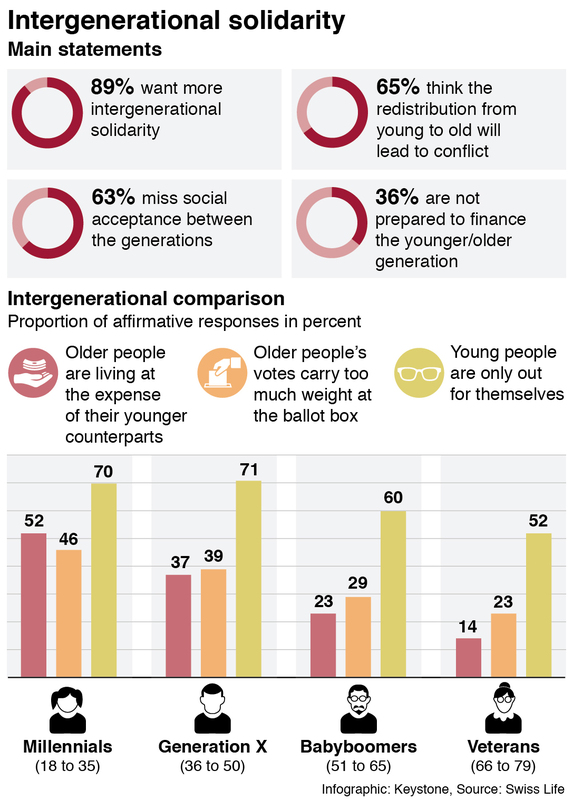 According to a representative survey carried out by Swiss Life among over 3000 respondents in Switzerland, Germany and France, there is a significant need for greater solidarity across all four generations. Nearly 90% of respondents – regardless of nationality or age – expressed this desire, which is, however, only partially fulfilled in reality: An average of almost 40% are unsatisfied by solidarity and dialogue between the generations at present. In addition, some feel that social cohesion is lacking, with 63% finding there is insufficient acceptance of older people in society. There's a similar view from the other side, as around half of those surveyed said they sensed a lack of respect for youth. Almost two thirds assume that redistribution from young to old will lead to conflict. The younger the respondent, the more likely he or she is to detect a potential for conflict (Millennials: 70%, Generation X: 68%, Baby Boomers: 63%, Veterans: 55%). Around a third each of Millennials, Generation X and Baby Boomers are not prepared to pay for older generations. 52% of Millennials and 37% of Generation X believe that older people today are living off the young. The older generations are markedly less likely to agree with this proposition (Baby Boomers: 23%, Veterans: 14%). 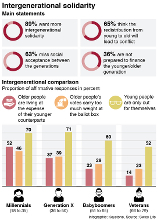 Of Millennials, 46% find that older people enjoy disproportionate power at the ballot box, as do 39% of Generation X. Only 29% of Baby Boomers and 23% of Veterans share this view. What stands in the way of comprehensive intergenerational solidarity is above all a difference in attitudes towards life and egocentrism. 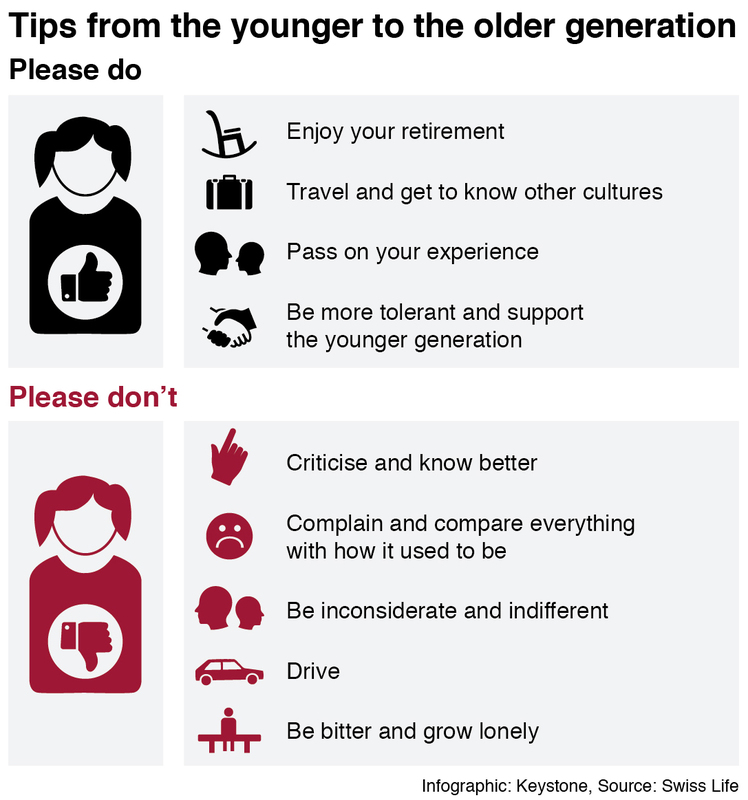 65% of all respondents think that the young are too preoccupied with themselves. Millennials and Generation X are even more convinced of this, with 70% of respondents from each cohort answering in the affirmative. So they are perfectly aware of their own egocentrism. On the other hand, 31% of all those surveyed believe older people are too concerned with their own interests, a figure that rises to a full 41% among Millennials. In addition to egocentrism, respondents suggested that insufficient dialogue and solidarity between the generations was mainly a result of the redistributive pension system, customs and attitudes specific to the various generations and a lack of respect. Intergenerational cohesion was given a very positive review in the family and at the workplace. 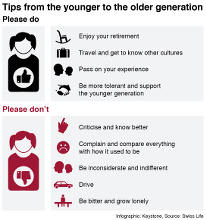 A good four out of five younger people (Millennials and Generation X) want to learn more from their seniors. Similarly, around four out of five respondents could imagine taking care of their parents in their dotage. At the workplace, around nine out of ten respondents in all age groups report that cooperation with colleagues from other generations is pleasant and instructive. What is more, 78% of those in employment see no distinction made at their companies between employees from different generations. On the other hand, to date only around every fifth respondent has seen his or her company strategically promote intergenerational collaboration. There are also certain reservations when it comes to cooperation: 54% of Millennials prefer to work with people of a similar age, and collaborating with older generations can lead to conflict for almost a third of that same cohort. The Swiss, German and French respondents are in agreement for the most part in their assessment of the survey contents. Differences arise when it comes to redistribution, the family and the workplace. The Swiss agree the most that older people today are living off the young (CH: 40%, G: 34%, F: 31%). In comparison with the French, the Germans and Swiss tend to be significantly more likely to believe that the redistributive pension system will be the source of conflict (G: 72%, CH: 69%, F: 54%). At the workplace, the Swiss rate intergenerational collaboration more highly than do their neighbours, with just 15% seeing potential for conflict (G: 26%, F: 34%) and only 29% admitting that they prefer to work with people of a similar age (G: 42%, F: 45%). The French (89%) are significantly more willing to care for their aging parents than are the Swiss (81%) and the Germans (77%). "Redistribution from young to old is considered an unfair burden"
Patrick Frost, CEO of the Swiss Life Group: "In view of the challenges facing society, the issue of intergenerational solidarity should be a central topic in public debates. The survey results demonstrate that people want strong intergenerational solidarity, and that they are prepared to work for it. At the same time, the potential for conflict also makes itself felt, with financial redistribution from young to old a thorn in the side of the young generations, and considered an unfair burden. Fairness to future generations demands therefore that our country reform its retirement provisions quickly and sustainably. It's the only way we can ensure that we will leave a well-financed, modern pension system to future generations." At the behest of Swiss Life, the LINK Institute carried out a study on the subject of "Intergenerational solidarity" from 30 August to 7 September 2016. A total of 3078 respondents, from Switzerland (1011), Germany (1033) and France (1034), aged between 18 and 79, were asked to answer relevant questions online. Each national group of respondents was composed of a quarter of the following generations: Millennials (18 to 35-year-olds), Generation X (36 to 50-year-olds), Baby Boomers (51 to 65-year-olds) and Veterans (66 to 79-year-olds). The study is representative. 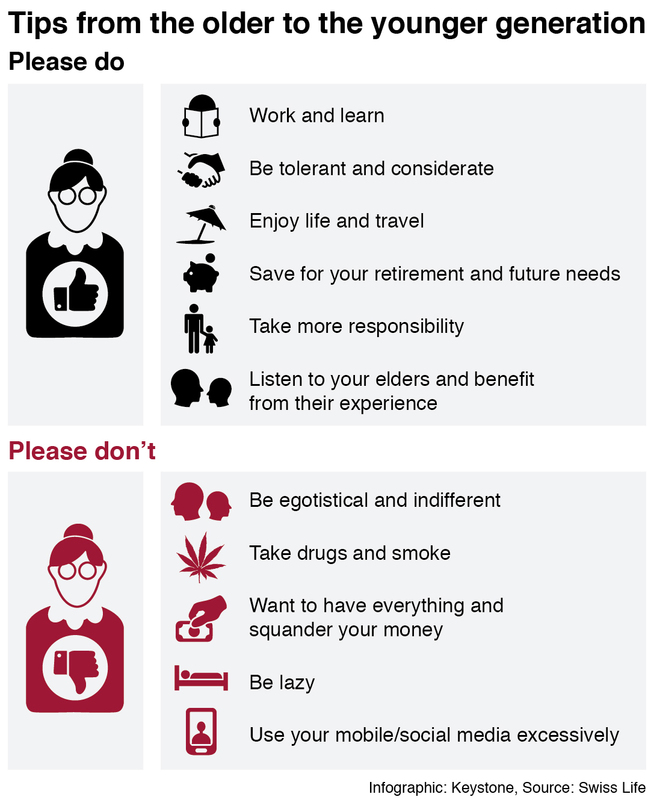 About the "longer self-determined life"
The Swiss Life Group aims to promote the subject of a "longer self-determined life" in public discussion over the next few years. This long-term corporate goal is part of the "Swiss Life 2018" strategy. There are articles, interviews, blog entries and more about a longer self-determined life on the Swiss Life Content Hub. The hub is updated regularly with new contributions.